Embrace Tradition. Embrace the Spirit. Embrace the Storm. Join us for one of UBC’s most iconic experiences! Participate as a competitive or just for fun team and complete the course as a relay, or challenge yourself to do the whole course on your own as an Iron Person. You will swim, sprint, bike, run, and Storm The Wall! Event Date: Sunday March 24 to Wednesday March 27, 2019. Teams of 5 compete in this one-of-a-kind event. Each person competes in a different leg of the race before meeting to Storm the Wall together. Ironpeople complete all the legs of the race on their own and Storm the Wall with the help of one other person. Depending on the Team Structure you choose, there are slightly different swim and bike lengths. 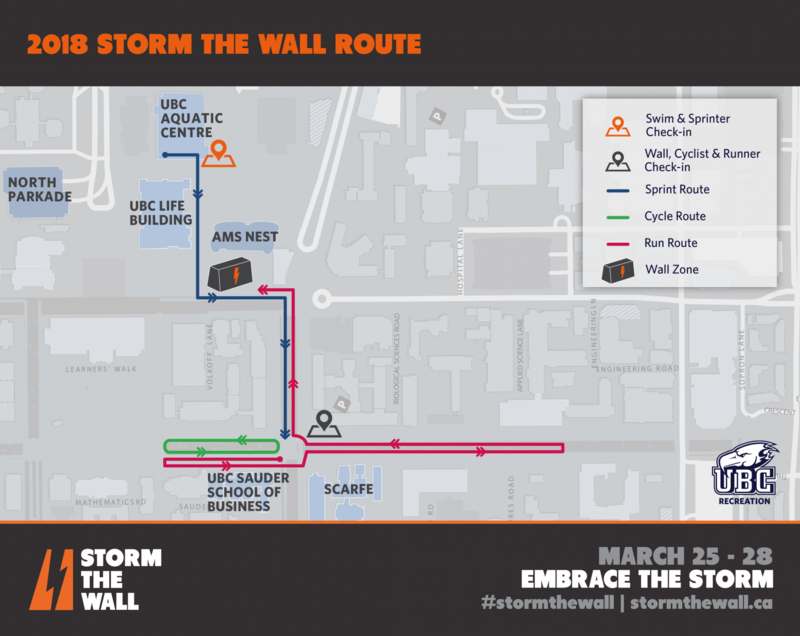 The 2019 Storm the Wall route has not been finalized yet. This will be updated closer to the event date with a possible new route, but it's very likely that things will remain the same. If you are ready to register your team for Storm the Wall collect the student ID number and email of your co-captain and head over to the Registration Page! As explained above, you will need, at minimum, a team of 5 individuals to compete on a Storm the Wall team. This event follows the standard Intramural Participation Structure format which is outlined below. Note: You can have a 6th person on your roster who is an alternate. This is recommended for competitive teams teams who may advance to and there is a high likelihood of scheduling conflicts with team members. If you are competing as a CoRec team, you can have a maximum of two self-identified men on course (i.e. doing the swim, sprint, bike, and run). The 5th person, who is the wall person, can be of any gender. Divisional (AUS, EUS, VAN, TOT, etc) teams are permitted one import on their roster. All imports must be current student, staff or faculty. **Please note: CoRec teams comprised of two units under the Hindmarch Division (ex. Beta/Alpha Gam) can only draw from membership of the same Hindmarch Units. Designated imports are not permitted. This includes the unit designated as “Phrateres”. New for Fall 2017, we have revisited our Iron Person Categories in an effort to improve the inclusivity of our programs. Please see the updated nomenclature below to identify which category you would like to participate in. Iron people complete all legs of the race on their own and then, depending on the category of iron person, have the assistance of one or no people at the wall. The only difference between each of the categories is the assistance at the wall - the route remains the same for all iron people. Ironpersons complete all legs of the race by themselves and get the help of one person at the bottom of the wall to get them over. Ultra Ironpersons complete all legs of the race by themselves and get the help of one person at the top of the wall to help get them over. Iron Legends complete all legs of the race by themselves and climb the wall unassisted. This year we will be selling limited edition Storm the Wall crew necks! Click here for more information on how to get your limited edition Storm the Wall crew neck. We're always looking for volunteers to help make this event a success! You'll have a blast with our staff, get a complimentary volunteer shirt, and we'll provide you with food throughout your shift. Opportunities are available at registration, timing, and on race route. Sign up by filling out our volunteer form. At UBC Recreation we aspire to include everyone in our programs and facilities. But you may have questions or concerns about if this event is right for you. If you have any questions or concerns please feel free to contact our event team at storm.the.wall@ubc.ca or call 604-822-6000. How many people can we have on our team? You can have 5 people competing in the race. However, you are allowed to have 6 people on your roster in case of substitutions during advancement heats. What is the CoRec ratio? Yes you can be on more than one team, but there are some restrictions. You can be on a maximum of one competitive CoRec team, and one non-CoRec team. You can be on any number of Just for Fun teams! How do I submit my team’s roster? Your team captain will receive an email containing all the detailed information on how to submit your team’s roster after the registration deadline. This email will provide you with a Team Access Code and Team ID. Once you have that information you can visit the Roster Portal and use the Team Access Code and Team ID to submit your roster. Can I change my heat time? Due to the large number of teams, we may not be able to change your heat time. However, you can request a heat change and we will do our best to accommodate you. Due to the nature of the event, we are unable to adjust advancement heat times. Send an email to storm.the.wall@ubc.ca with your team name, captain's name, and your original heat time and we will get back to you as soon as we can. I don’t have a bike, what do I do? We have a limited number of bikes and helmets that we rent out free-of-charge. Email storm.the.wall@ubc.ca with your name, student number, email, team name, and the date and time of your race. Send this email as soon as possible in order to guarantee that we have a bike for you! You can also rent a bike from More Bikes (located in the Wesbrook Village) for a fee. How do you get over the wall? There are many different techniques, all of which you can learn when you go to your Storm the Wall clinic! What is a Storm the Wall Clinic? Storm the Wall Clinics are sessions that provide all the information on how the race works and assist you in ensuring that your team knows what to do on race day. They also include a practical session where you can learn the safe technique and practice going over the wall. During clinic days, sessions run every half an hour from 9:30am-4:30pm. At the time of registration, you'll register for a clinic before registering for your race heat time. How does my team advance? Advancements are based on the first team in each heat, with some advancements based on time. Where do I find the advancement information for my team? Advancements will be posted on our Heat Schedule and Results page by 8:00pm each night. Please check back regularly to see if your team has advanced. Do we have to compete in our advancement heat? No, you do not. However, if you do not wish to compete in your advancement heat, please send an email to storm.the.wall@ubc.ca and let us know that you will not be attending your race so we can provide the opportunity to another team.